Exploring modern techniques, operational efficiency and vegetarian cuisine. Location: Framtidens Kök at Electrolux Global Headquarters in Stockholm. Framtidens Kök is also the home to the Swedish Culinary team, the most awarded culinary team in the world with “Respect for the resources” as their motto. 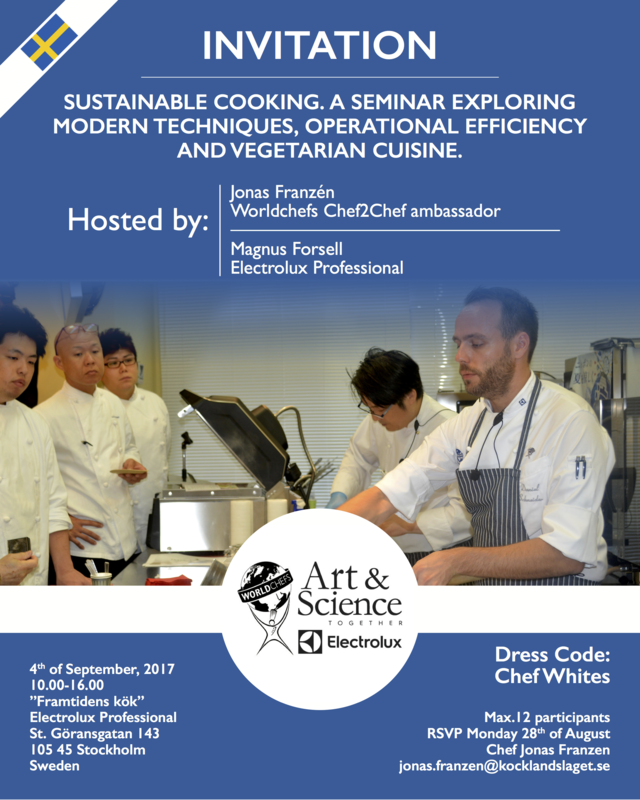 Seminar is hosted by Jonas Franzén, Worldchefs’ Chef2Chef ambassador, chef Fredrik Juhlin, former culinary team member and Magnus Forsell, Executive chef and customer trainer of Electrolux Professional in Sweden. Electrolux Professional and WORLDCHEFS are pleased to invite you to a Chef2Chef training seminar as a part of their “Art & Science Come Together” alliance. These workshops will educate chefs on implementing sustainable and innovative practices in the kitchen while maintaining high standards. The chefs will serve quality food, balancing a mix of Electrolux innovative solutions and the chefs’ creativity. The seminar will focus on sustainable cooking that incorporates ingredients, technology and kitchen operation, which improves chefs’ daily activities. The aim of the seminar is to build on and extend the range of skills, techniques and knowledge helping you to achieve operational excellence in the field of more sustainable cooking. You can also expect to increase your network of talented chefs in the same field of interests. Master sustainable cooking techniques by using modern cooking technology. Be able to lower your “food print” by implementing eco-driving techniques. Gain knowledge and inspiration in vegetarian cuisine. Know how to optimize workflow processes incorporating the latest high speed cooking technologies. Discover WorldChefs organization and various projects by WorldChefs. Be able to improve operational efficiency in daily kitchen operations. Learn about ergonomic kitchen solutions. Välkommen att delta i ett seminarium om hållbar mat för professionella kockar i regi av Worldchefs. Tillsammans utforskar vi vegetariska rätter och modern köksteknologi som effektiviserar arbetet i köket. Worldchefs Chef2Chef representant Jonas Franzén och Magnus Forsell, Electrolux Professional. St: Göransgatan 143, 105 45 Stockholm.